As the name suggests, it's more like a bistro or a cafe rather than a proper restaurant. The bistro is not easy to find but would be worth the effort. It's tucked in a mall (Walkers Arcade) and located off the Front Street in Hamilton and at a walking distance from the Hamilton ferry terminal. The restaurant is owned and managed by Angelo Buglione, the person who once used to run the erstwhile well known restaurant Splendido which closed down in 2011 because the hotel (Horizons & Cottages) where the restaurant was housed, had also closed down. This restaurant is quite small. Other than inside dining, there is a small courtyard outside. Weather permitting, tables are a laid out in the courtyard (i.e. an outside patio) in a circular fashion around a fountain. You can choose to sit inside or outside. The inside dining is air-conditioned and the interior is lively having bright orange walls, tiled floor and wooden tables laid out in rows. The bar counter with tall wooden stools is tucked in one corner. The walls are full of paintings. Angelo's Bistro received 'Best of Bermuda' award in 2015 for their quality and range of gluten free food. Yes they do serve a large variety of gluten free items including chocolate cakes, and they really make them well. If you are looking for gluten free food, then ask for the gluten free menu. In breakfast the menu includes Pancakes & Crepes (of various types), eggs to order, toast, bacon, house cut fries, muffins etc. If you are planning for lunch or dinner, in starters some of the favorites here are Bermuda Fish Chowder (local soup made with ground head of fish), grilled seafood or tiger shrimp salads, artichokes & avocado salad, arugula salad, crispy fried calamari, fresh salmon gravlax etc. The menu also includes a range of seafood, meat, homemade pasta & risotto items. Try out the grilled seafood medley which is prepared with wahoo, shrimps, scallops, lemon, risotto and spinach. Steaks and lamb chops are also great. Other items to try during lunch and dinner would be beef striploin, pan roasted salmon, seafood spaghetti, handmade ravioli, breaded chicken milanese, handmade crispy gnocchi etc. They have a nice and simple kids menu as well which includes items like chicken tenders with fries, crusted cheeze pizza, cheese sandwiches, fish & chips, pasta etc. They serve alcohol. Free wi-fi is offered. You need to ask the waiter for the password and he would usually walk up to the manager to get you the password. The service is usually good and quite friendly. They offer take out as well and there is a separate take out menu which includes most of regular dinner menu items plus more. Dress code is smart casual. Reservation is not required. Monday through Saturday: 10am to 9pm (Sunday closed). Serves Breakfast, Lunch and Dinner. 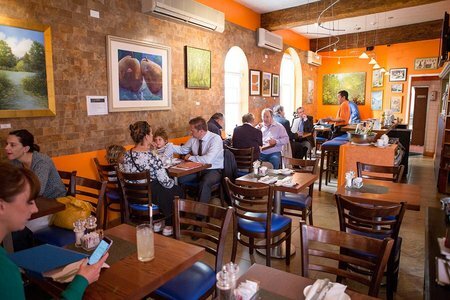 1) Check out Top Bermuda Restaurants for all our favorite restaurants in Bermuda. 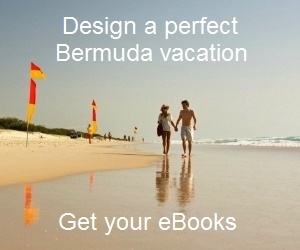 3) Check out Restaurants & Bars Directory for a complete list of dining options in Bermuda.